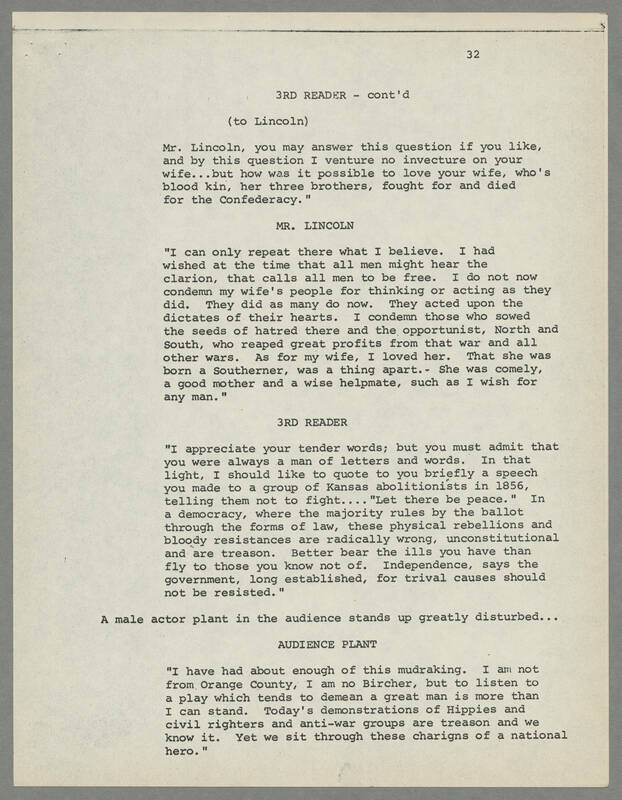 32 3RD READER - cont'd (to Lincoln) Mr. Lincoln, you may answer this question if you like, and by this question I venture to invecture on your wife...but how was it possible to love your wife, who's blood kin, her three brothers, fought for and died for the Confederacy." MR. LINCOLN "I can only repeat there what I believe. I had wished at the time that all men might hear the clarion, that calls all men to be free. I do not now condemn my wife's people for thinking or acting as they did. They did as many do now. They acted upon the dictates of their hearts. I condemn those who sowed the seeds of hatred there and the opportunist, North and South, who reaped great profits from that war and all others wars. As for my wife, I loved her. That she was born a Southerner, was a thing apart. She was comely, a good mother and a wise helpmate, such as I wish for any man. 3RD READER "I appreciate your tender words; but you must admit that you were always a man of letters and words. In that light, I should like to quote to you briefly a speech you made to a group of Kansas abolitionists in 1856, telling them not to fight...."Let there be peace." In a democracy, where the majority rules by the ballot through the forms of law, these physical rebellions and bloody resistances are radically wrong, unconstitutional and are treason. Better bear the ills you have than fly to those you know not of. Independence, says the government, long established, for trival causes should not be resisted." A male actor plant in the audience stands up greatly disturbed... AUDIENCE PLANT "I have had about enough of this mudraking. I am not from Orange County, I am no Bircher, but to listen to a play which tends to demean a great man is more than I can stand. Today's demonstrations of Hippies and civil righters and anti-war groups are treason and we know it. Yet we sit through these chagrins of a national hero."